Laura Orlando is a member of the Rural America In These Times Board of Editors. What follows are some notes about a trip to Europe she’s taking with her daughter. Check back for latest entries. I am an engineer. My global travels started after college on a round-the-world trip that included time in Sierra Leone, Kenya, India, and Nepal. A year later, I lived and worked with the AMISTAD construction brigade in Nicaragua. Why look back? Because on my first real trip to Europe, I’m going to Greece with my 15-year old daughter, Eliza. The banks are closed, there are protests in the streets, and uncertainty sparks and crackles in the Grecian summer night: it’s my kind of traveling. In the summer of 1988 I drove from Michigan to Nicaragua in a powder blue pickup. I stayed for 17 months. The truck was packed with composting toilet parts, boxes of supplies, and my mountain bike. I brought most everything I thought I would need. The store shelves were bare in the country, the result of a trade embargo implemented in 1985 to undermine the Sandinista government. The embargo and a US-financed and directed war destroyed the country’s economy. In 1988, Nicaragua reissued its currency, with the new note equal to 1,000 times the old one. By the time I left at the end of 1989, inflation was at 43,000 percent. A bar bill for a $1,000,000? I’ve paid that – in córdobas. I never stopped traveling. It’s been part of my life for the past 30 years, but Europe was never on the itinerary, until now. Last fall Eliza suggested a trip to Greece. I was getting chemotherapy for breast cancer. The idea seemed so fantastical. Travel to Europe? I can hardly get off the couch. She showed me a picture of the Caldera in Santorini and said “Come on mama, this is going to make you feel better.” I told her to plan the trip and we’d go. She chose Athens, Mykonos, Santorini, and Milos. We leave today. Today is also the day Greeks have an up or down vote on whether to accept the condition of the European bankers demanding payment on a portion of the nation’s large debt. The demands include raising taxes, cutting pensions, and adding to the unemployment rolls. Dozens of countries have had stimulus policies to address economic trouble, including the United States’ successful efforts in 2008-2009. The European Central Bank, IMF, and their bureaucratic colleagues in the Eurozone (a union of 19 of 28 European member states sharing the same currency and coordinating monetary policy) won’t let Greece – a member of the Eurozone - get on its feet. They are scavengers after scraps until only the bone remains. This week Bernie Sanders, Presidential candidate and Senator from Vermont said, “At a time of grotesque wealth inequality, the pensions of the people in Greece should not be cut even further to pay back some of the largest banks and wealthiest financiers in the world.” The average pension is US$770/month. Half of Greek families are supported by this income. The European Central Bank was responsible for Greece’s recent bank closures. They and their colleagues in the Eurozone want a bigger piece of Greek pensions and they want the Syriza government, and its leader Alexis Tsipras, out of office. It’s a slow-motion coup d'état. Tsipras is letting democracy have a little say in Greece, while the un-democratic Eurozone breathes down his neck. 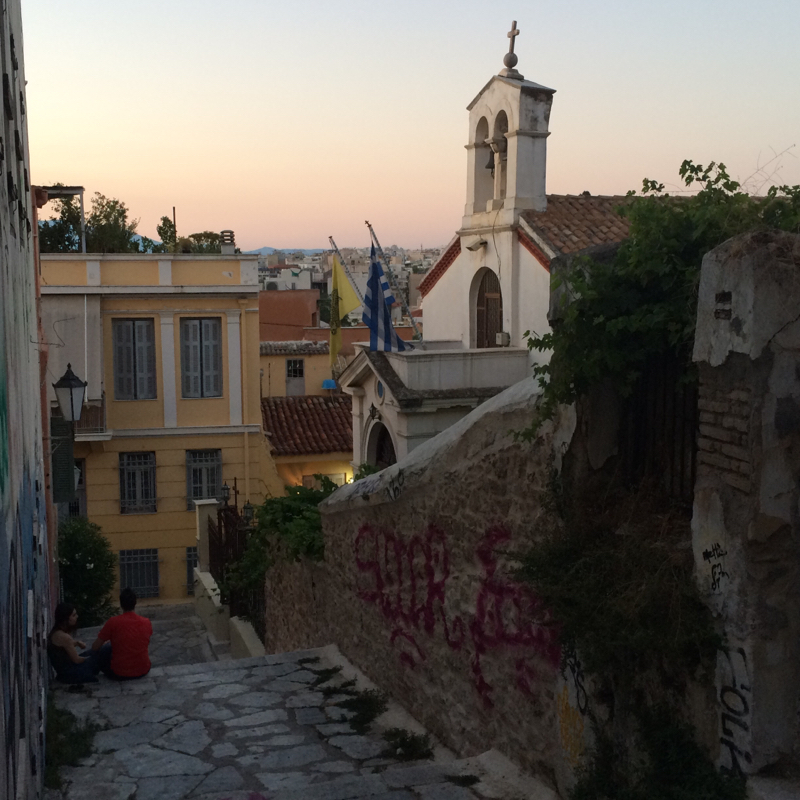 Tomorrow I’ll be standing with Eliza in the shadow of the Acropolis, putting a little feeling into my oxi – no - vote. When Eliza and I arrived in Athens on Monday afternoon, Sunday's referendum tally was in: the Greeks rejected the Eurozone's bailout terms with a majority no vote. Oxi (no) posters are everywhere. The nai (yes) campaign had the right-wing media. The left had people and wheatpaste. I'd like to thank the European Central Bank and the IMF for the subway ride from the airport to our hotel. It was free -- though, there really should be a donation bucket for tourists like us. Of the Salvation Army's $4.3 billion in revenue last year, $2 billion came from private donations. Bell ringers for bailouts? Who would get more donations standing outside Syntagma station, Jon Stewart or Audrey Hepburn? I've got short, gray hair like Jon. A man who describes Greece as a country whose language is written in frat symbols. I also lost 15 pounds and can ride a motor scooter (don't forget the short hair). With a little hair dye and a lot of ouzo that puts Audrey Hepburn in the running. Hepburn said, "I believe in being strong when everything seems to be going wrong. I believe that happy girls are the prettiest girls. I believe that tomorrow is another day, and I believe in miracles." A little long for a wheatpaste poster, but tempting. I'll skip the bell ringing. I'm not funny or pretty enough to pull off the masquerade. Besides, the Greeks have Tsipras and the Syriza government. The Greeks don't need charity. They need their elected government to speak on their behalf. And that's what the no vote was all about. 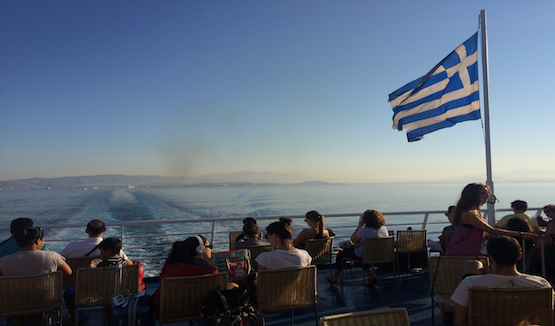 What is it like to travel in Greece during this period of economic uncertainty? As a tourist with a fistful of Euros, it is not difficult. The metro is running, taxis are carrying passengers, stores are open, and there are no street protests. Unlike what the BBC recently reported, people are not "watching in powerless resignation." Many with whom we've spoken have used words like "independence" and "pride" when describing their feelings about the outcome of Sunday's referendum ("no" to the terms set by the Eurozone creditors). The Greeks are waiting with anticipation. I've not yet seen a television tuned to other than news. They will tell you that, if they have money, they are not spending it. No matter where the blame is placed for the economic troubles or what the street corner solution, the people we have talked to say money is tight and there are no jobs. Our cab driver in Athens volunteered his opinions before we buckled into our seats. I asked his name. "Friday," he answered. "Friday?" "Yes. Friday." It was Wednesday. Did he sing goodbye Ruby Tuesday? Who could hang a name on you?/When you change with every new day/Still I'm gonna miss you." Was he talking about Syriza, the anti-capitalist, anti-austerity Greek political party currently in power? The Euro? The terms of the Greek bailout? His voice broke my reverie. "I work 15 hours a day. If I'm lucky I take home 40 Euros a day. And the Germans call the Greeks lazy. How many more hours a day can I work to no longer be called lazy?" Friday was talking about the fiscal chaos and said the Greeks "need to be more serious." (This from a guy who calls himself Friday?) A few minutes later, the "Athens Happy Train," a miniature train that carries tourists around town, pulled in front of us. A little boy in the rear of the train, sitting between his parents, was facing our stopped car on one of Plaka's narrow streets. Friday waved and stuck out his tongue. The boy laughed. Friday took his hands off the wheel and put them on his ears, wiggling them until the boy waved furiously back at us. That'll get anybody through an economic crisis. How do we handle traveling here when people are jobless and hungry? The same way we handle it moving through the streets of our hometown, where people are jobless and hungry, with awareness and compassion. Eliza and I have explored the Acropolis and walked through the streets of old Athens. When I look at the Parthenon, I see the elegant detail of the architecture and the reach for something greater than the individual. I also see the destruction of thieves, haters, and warriors. There it stands, after 2,500 years, in pieces, but beautiful. When we checked out of our Athens hotel, I asked Donna, the Greek woman at the desk, what she thought of the crisis. She turned from the television news and shrugged: "Everything is well. These people have a five thousand year old history. They will be ok. We will be here." you Can Find Out >s..
Hmmmm seems to be a universal language right now. Calling people lazy. Jeb thinks people in the states need to work more hours. Go to his FB page. A lot of people there telling him how many hours they are already working.